BMW have quickly improved over the winter to become the third team in F1. Yet it is not enough and improvements are coming quickly to close the gap with the leading teams. At Barcelona the team had a new main plane ready for the front wing. It was strangely not tested before during the Barcelona test but instead Mario Theissen only made an announcement on Thursday that the team would run a new item Friday morning. The new main plane is more edgy in the middle than before and aims to better profit from central air. Since in the middle, the front wing can be as low as the reference plane, the new wing catches more air than before, thus generating more downforce. Personally, I consider this a major aero upgrade for BMW. It\'s much different than the previous version, and a lot more air passes through the center section. Will we see some teams copy this new application, instead of the current curved spoon shape? I doubt it, we have seen over the last couple of years teams swapping from this configuration to the curved spoon, depending on the track. 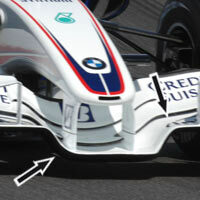 The thing I\'ve been wondering most about BMW-Sauber is actually about the rear wing. I noticed that in Melbourne and Barcelona the bottom of the rear wing was completely level across the entire wing, while at Sepang and Bahrain the was a slight arch along the bottom, which reminds me of Renault. I\'ll spare my own thoughts and ask if anyone can enlighten me?